Harris County Judge Ed Emmett, Brazoria County Judge Matt Sebesta and Galveston County Judge Mark Henry, from left, stop for a photo together at the Bay Area Houston Transportation Partnership State of the Counties Luncheon at the Houston Marriott South Hotel. The annual State of the Counties Luncheon is always the highlight of the year for the Bay Area Houston Transportation Partnership, and this year was no different with President Theresa Rodriguez greeting many area mayors and city councilors, eager for an update. 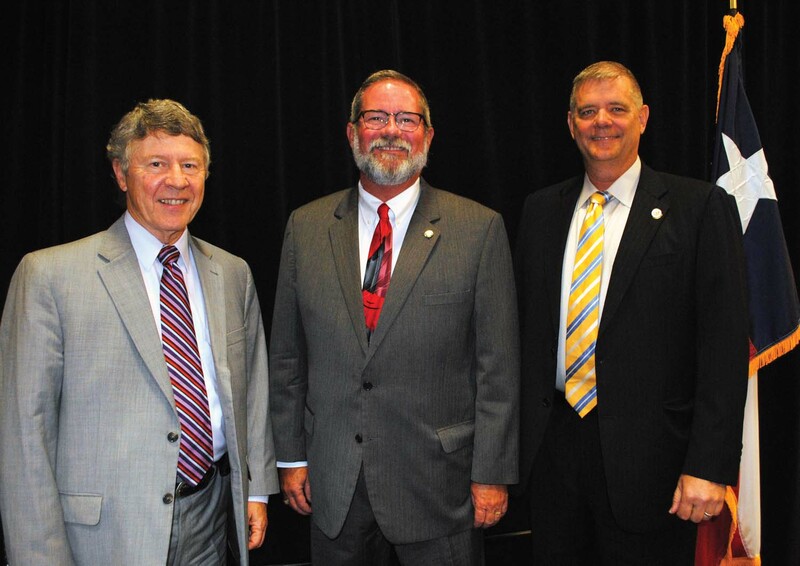 Harris County Judge Ed Emmett, Galveston County Judge Mark Henry and Brazoria County Judge Mark Sebesta each talked about the effects of Hurricane Harvey, the transportation challenges they face and what they hope for the future. After Chairman David Hamilton welcomed the crowd — that included Mayors Pat Hallisey of League City, Jeff Wagner of Pasadena, Tom Reid of Pearland, Carl Joiner of Kemah, Michel Bechtel of Morgan’s Point, Thom Kolupski of Seabrook, Louis Rigby of La Porte and Mark Denman of Nassau Bay — the Charles A. Jacobson Award was presented by Judge Emmett. The 2018 recipient was Port of Houston Authority Chairman Janiece Longoria, an attorney who is a frequent speaker on the importance of Port Houston, infrastructure and transportation. Judge Sebesta said Harvey was not a hurricane, but a bad-a– rain storm that flooded 13,000 homes in Brazoria County. “Harvey was the significant event of a lifetime,” he added. Then, to update the BayTran crowd, he said the Highway 288 project was actually under construction “…after talking about it for years.” The project actually came to fruition through a partnership working with Pearland and TxDOT, he added. Judge Henry, just re-elected to his third term and happy over the recent passage of a proposed bond issue, said Galveston County is facing many challenges with all the road work TxDOT has under way along I-45 from the north county line past Highways 518 and 646. “Evacuation this summer might be a real challenge,” he said, adding with a smile that the best travel time along the freeway in Galveston County is between 2 and 4 a.m. The construction work will not be completed until 2021, he said. Meanwhile, work on the Pelican Island bridge is getting started. Other officials in the crowd included Galveston County Commissioners Ken Clark, Joe Giustie and Darrell Apffel, Harris County Clerk Stan Stanart, plus City Councilors Hank Dugie and Larry Millican of League City, Nancy Ojeda of La Porte, Natalie Picha of Seabrook, Thomas Schoenbein of Pasadena and Ashley Graves of Nassau Bay. 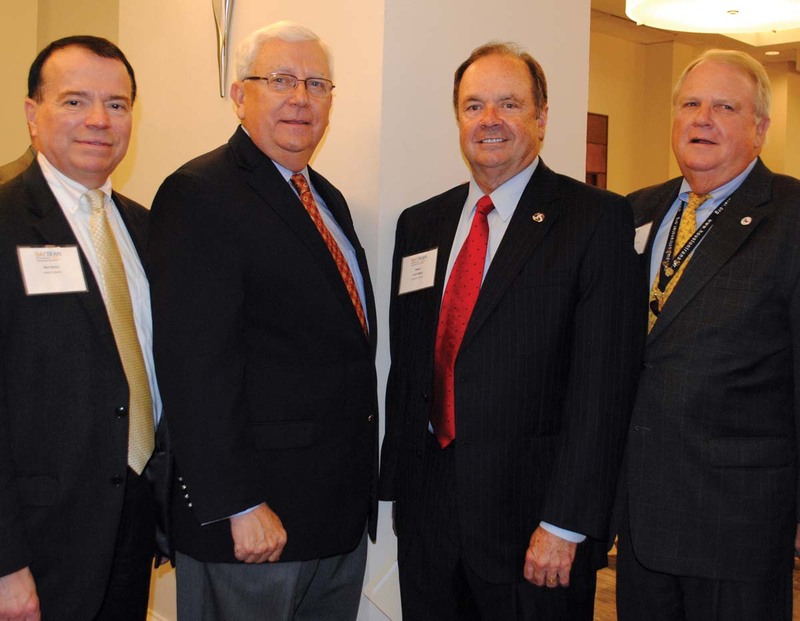 Port Commissioner John Kennedy, second from left, arrives at BayTran’s State of the Counties Luncheon at the Houston Marriott South to find himself in the company of, from left, Harris County liaison Ron Servis, La Porte Mayor Louis Rigby and Ken Fickes with Harris County Transit Services.